In the early 1890’s, Ernesto Sabatella , former priest turned revolutionary genetic scientist, hypothesized and created a compound that could allow the spontaneous hybridization of living cells. He called this elixir the Esheridadae compound – with which he manifested countless abominations in his pursuit of the ultimate goal – to find the key to Gods grand plan. Through his research he found nothing but the same simple fundamentals of the work of Charles Darwin. His faith dwindled, yet his hunger for deeper meaning to existence found new heights, taking him further into the upper echelons of fringe science, the malpractice of inflicting pain upon his victims to seek his new, maddening goal. If there was no god, then the throne lay empty. With his knowledge, Ernesto Sabatella would become no less than a god. It was five years after the successful reanimation of Grigori Rasputin. The year was 1921 and Grigori had disappeared in a cocktail of drugs and hyper-dimensional hypnotic transgression, seeking out the planes of unknown Kadath and the plateau of Leng. Thaddeus Belacleese had returned to England, under the name of Dr. Jekyll, with a plot to assassinate the entire Royal family. The trio were all infused with the puissant life giving aether of their combined research, lengthening their lives by decades. It was in these later, cheated years that Ernesto sought out godhood. He took his research to a small island in the Adriatic Sea, where he found the comfort of isolation a perfect atmosphere for the most frightening stage of his research. He hired pirates to bring him men and women from captured vessels, who he applied his research to in fits of fanaticism, cutting away human flesh and replacing it with grafts taken from various animal species. He forcefully impregnated women and experimented upon their young. The horrific torture chamber of his vile experiments became known as “the house of pain” by the slaves of his research, but those who he had successfully reconfigured soon lost the will to fight their master – the man who fed and clothed their hideous bodies, their God. They were no longer human, spanning species like chimera – sometimes the human frame was plowed of flesh and replaced with that of a pig, a goat, a leopard or wolf. Sometimes he carved off heads and replaced them with those of other species. Many died, but many, sadly had no choice. The Esheridadae compound would render rejection almost impossible, fusing skin with alien skin, bonding cells that should not share the same body. Childrens torsos attached clumsily to the bodies of dogs, A women with the head of ram. This was his insanity made flesh. He created a set of feeble laws that his manimals would live by, so that he could control the behavior of those who had once fed on nothing but flesh – his cat men, the wolf girls. He had reconfigured bone and muscle, brain and spinal column in the carnivores, so that they stood tall, and walked with bipedal gait. Yet they still harbored the desires of their former selves, and it was this he wished to quell. They would not feed on meat, they would not give into animal instinct. But it was a fragile equilibrium. So much hate for their creator boiled below their tortured skin, hate that would know only one course of action. Ernesto was often approached by the authorities of the local Governments, yet his island sat between the rule of Italy and Croatia. He communicated with them with a Pseudonym, Moreau, an apt title, taken from the treaty of Moreau, a doctrine on the consideration and humane treatment of non human animals. Ernesto fabricated a tale of humanitarian research and the need for peace and quiet upon his island, which seemed to satisfy the officials of each respective country. The howling that emanated from the complex of buildings constructed for his terrible use were explained away with tales of guard dogs, protecting his valuables from pirates. He paid them off with flattery and large donations, allowing him continued free reign. But his victims soon vowed vengeance. He had cut the flesh without considering the intellect. Many had kept quiet as he had sewn them into new skins, gritting angry gnarled teeth as he had spoken ill words of his desire to rule, and in these silent moments, plots were hatched. Those who recited the laws found a new key to rid themselves of these ill fitting bodies. They would cut away the atrophied flesh. The uprising tore through Ernesto’s island. His creations barricaded themselves within the house of pain, as those who had learned of his research attempted to repair the damage. Those who were beyond such procedures took their bile and armed themselves, awaiting the moment that Ernesto would fall before them. But he did not come. They bayed for his blood, but he stayed within his ivory tower, awaiting the animal instincts to subside, for he knew that those with intelligence would come to him, plead for release. The sayer of the law, the leader of his creations, came to him, and begged for release. Ernesto took pity on him but explained that with his animal features he would be nothing but a freak of nature, he would be hunted down or enslaved in a circus. On the island he was king. The sayer did not take kindly to the baiting, the offer of leadership was not what he wanted. He found the animal rage within and slew Ernesto, removing his head and carrying it out into the awaiting crowd. “Our god is dead!” he howled out, dropping the fleshy tome upon the floor. The animal men and women abandoned their hovel village and occupied the house of pain, removing all trace of the practices. Apart from this piece, the lasting physical legacy of Ernesto Sabatella, The Doctor known as Moreau. The children of his victims were born almost entirely human, in rare cases genetic material had been blended, but many of the operations had merely been aesthetic. They left the island, taking with them proof of his vile practices and the story of Dr. Moreau. 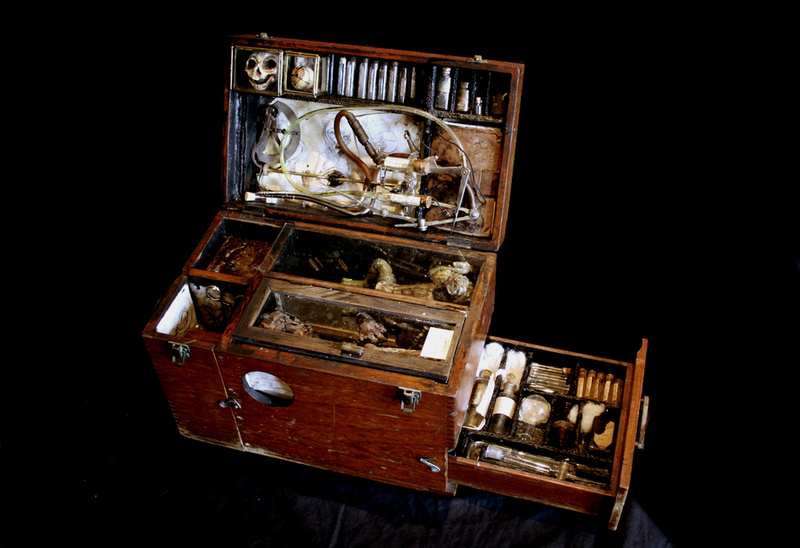 Within this large case are the trappings of the esheridadae device, a frightening aparatus that drip feeds the compounds into the blood stream. Assembly is simply, upon a metal stand, yet clips into the roof of the case. A small area of the box opens to the left where various vials of the compound are kept in liquid form, along with scalpels for skin grafts. There are three large infant specimens – a tortoise/human hybrid, the most intact of the three. The largest is part feline, presumably a leopard, with horrific human skin grafts on its face and chest, it also has bone reconfiguration to achieve a bipedal stance. The third is part lizard, part fetal human. 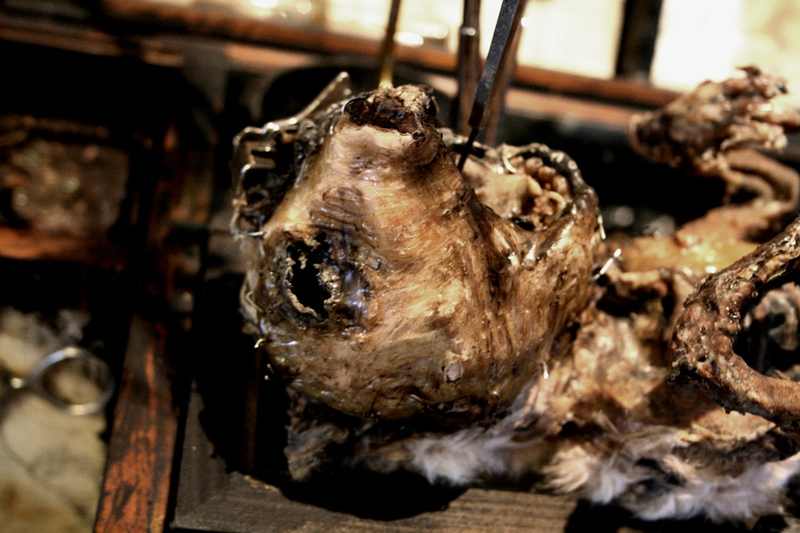 There is a small human skull, and a preserved fabricated eye, made from various animal and human parts. 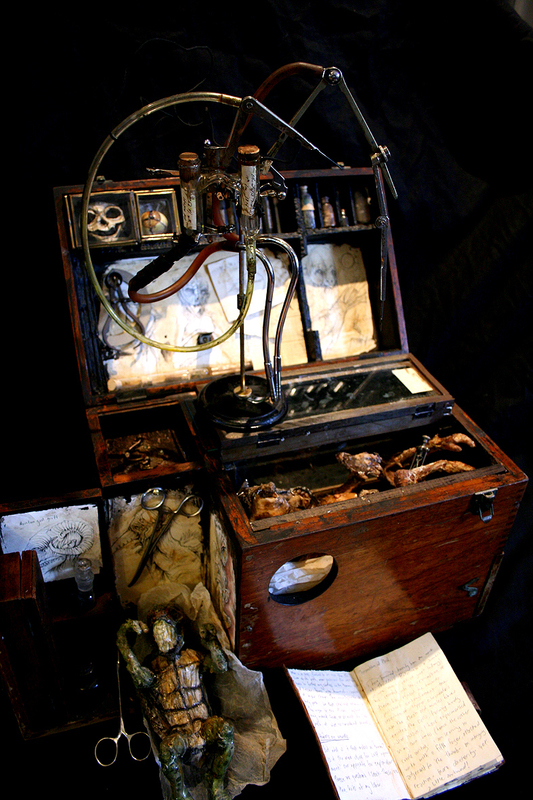 The discreet draw hides a menagerie of specimens and elixirs. There are detailed note books with illustrations of the parents of each specimen, dissection and reconfiguration procedures, maddening notes of his growing insanity. A horrific yet intriguing artifact.